Yachting Boating World: Sunseeker 95 Yacht will get its world premiere at at the British Motor Yacht Show at Swanwick Marina from 20th – 22nd May 2016 and Princess will be showcasing their first flybridge with IPS, Princess 49. 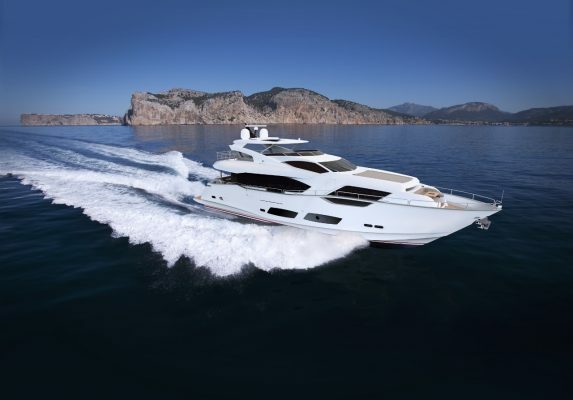 Sunseeker will launch the eagerly anticipated 95 Yacht at the British Motor Yacht Show. The new yacht exemplifies the latest in Sunseeker’s cutting edge design and build processes. Fully equipped for luxury entertaining, its open plan layout and striking lines manifests a super yacht feel with all the practical advantages of a yacht in this size category. Princess will also be showcasing their first flybridge with IPS for the first time, the Princess 49. Other British luxury yacht brands to showcase their craft at Swanwick Marina will be Fairline with their Squadron 60, Squadron 48, a Targa 48GT and a Targa 38 Open. These iconic companies will be joined by a host of handpicked industry-leading exhibitors. Now in its fourth year, the British Motor Yacht Show promises to deliver a stunning line up of the best of British motor yachts, leading engine manufacturers, marine electronic specialists, Williams RIBS and luxury car brands such as Porsche and Maserati. Open daily, between 10am and 5pm each brand will showcase a line-up of new and used yachts, in the water and on shore, with some measuring up to 98 feet. Peter Bradshaw, Chief Executive at Premier Marinas said: “This show is a renowned event and key to the Premier diary as it becomes more prestigious each year. I’m delighted that Swanwick Marina will once again host this collaboration between three of the biggest names in British motor yacht sales”. This is a not-to-be-missed show for buyers and boat lovers, where they will have the opportunity to get up close and personal with the most famous motor yachts in the world and speak to experts on all the exciting aspects of motor yacht ownership. There is also the opportunity to take a tour of Premier’s flagship Hamble river marina with its multimillion pound boatyard and luxury facilities.